Please enjoy this Charles Bukowski poem I recently discovered and love. I hope you enjoy the space. Last month, Petroleum Wife nominated me for the Very Inspiring Blogger Award. OH MY GOSH That is so cool and so sweet! Oh wait, you mean I have to do something? What is this, a chain letter? Oh, OK, this is actually pretty cool. Petroleum Wife’s list of other nominees is a gold mine of talented authors and a really great way to build online community. Some of these blogs I just can’t stop reading. I like this. Who can I nominate? There are some rules that go with the award. I’m not good at rules, but I’ll try my best to follow. 1.Display the award logo on your blog. 2.Link back to the person who nominated you. 3.State 7 things about yourself. 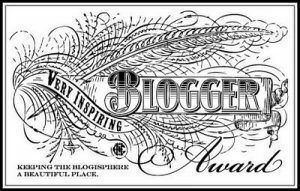 4.Nominate 15 bloggers for this blog and link to their pages. 5.Notify these bloggers of the nomination and the awards’ requirements. 1.) I started blogging in 2007 with an Austin, Texas based food blog. I loved it! I met so many friends and learned so much about food and cuisine. 2.) I have a degree in aerospace engineering but currently work as a freelance writer and yoga teacher. Writing and yoga are two major passions of mine. 3.) I’ve lived in 3 different countries: The U.S., the UK and Singapore. I’m defining living as spending 6 months or more somewhere. I’m still trying to come up with a new blog name after my last move! 4.) A flight “home” to Texas takes 24 hours. 5.) I put the word home in quotes because I struggle with the concept. Where is home? Home is where you hang your hat. Home is whenever I am with you. I try to live by the concept that home is underneath your feet. 7.) When I exhibit such qualities in #6 online, I start to have dreams that I am showering in public naked. Quite a variation of the showing up to school naked dream! For some reason, it doesn’t really stop me. Whew! I got through all 7. I hope I don’t start having those dreams again. Now for the important part, the nominees! These are in no particular order other than categories. Some of the blogs cross over into multiple categories, but eh, I tried. 1.) Petroleum Wife, of course! OK, so I listed 16. I told you I wasn’t good at rules. Seriously though, I could have gone on forever. Anyway, there they are. Go check them out.